Congratulations to sophomore Olivia O who was selected as a member of the Ryan Nece Foundation Student Service Program, dedicated to emPOWERing teens to become leaders and impact giving in their communities. Originally signed to the Tampa Bay Buccaneers as an undrafted free agent in 2002, Ryan Nece was a part of the Buccaneers team that went on to win a World Championship that season in Super Bowl XXXVII. 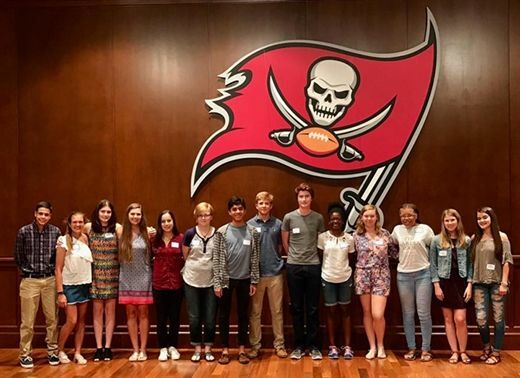 His team of teens have monthly meetings focused on civic involvement and Tampa Bay Area nonprofit projects throughout the year. In the summer following their junior year, the students participate in an end of the year service trip. As seniors, the students remain involved in the program by mentoring the next group of students selected and continuing to volunteer with the Foundation. Olivia was selected for the program through an application process. A panel of judges reviews the applications and selects 12 Tampa Bay area high school sophomores for the program based on evidence of genuine interest in the areas of community service and civic engagement, academic achievements, and more. This enriching experience will give Olivia great service opportunities and a chance to meet other young leaders. It will also let her be exposed to the needs and issues facing our entire community.